When I was living in Japan, I volunteered at a soup kitchen for homeless day laborers in a neighborhood in Osaka. The men who came to the soup kitchen for hot meals each day were the invisible of Japan. Most of them were Korean Japanese, burakumin (the “untouchable” class of Japan) or Ainu (the indigenous people of Japan); all three groups are heavily discriminated against, and because of that, they tend to be underemployed. Much like our immigrant workers in the United States, the men stand in groups on the street in the morning, hoping that a truck will stop and take them to a construction site or other location for a day of work. When they do get work, they take their cash from the day and come back to this ghetto neighborhood, spending the money on alcohol and pachinko (a Korean gambling game), and a night’s stay in a boarding house. When they don’t work, they sleep on the streets, and spend the few dollars they have buying hot sake out of vending machines. Those who are aging or sick are the most vulnerable, because not working means not having food and shelter. The soup kitchen was a project provided by a group of Japanese Catholic nuns and priests, affiliated with an order from France. I learned of their existence when I met a young Japanese woman who was Catholic. In my own Osaka neighborhood, only four train stops away, no one had ever heard of this ghetto, and all assured me that there were no poor in Japan, and also that there was no discrimination. On weekends in the winter, I sometimes went out on night patrol, driving through the streets in a van. We stopped whenever we found a group of huddled forms in the darkness. We offered rice balls and hot miso soup, and handed out extra blankets. On the coldest nights, it was not uncommon to find a corpse among the living, someone whose poor health could not sustain them through the extreme chill on the concrete. There was one particular older man who I grew to know well. He was aging, and sick, and rarely able to work, and he sought comfort in sake and the friendships he had with other men in the area. He was always good humored and friendly. Once I accompanied him to a medical clinic as an advocate. He was having circulation problems, and one of his legs was turning black. His rough, rambling speech was incomprehensible to most. I found myself in the ironic position of serving as a translator, a white American woman rendering his slurred expostulations into meaningful Japanese for the attending physician and nurses. As the weeks wore on, his condition worsened. He began to be incontinent, showing up in soiled clothing. Finally, the priests decided he needed to be taken to a hospital to be treated, and cared for long-term. When he had been gone for several weeks, I asked if I could visit him. One of the priests took me to see him, at a hospital clear on the other side of the city. They had taken him there, instead of to a nearby hospital, because he kept trying to escape and return “home.” Now he was so far away, that if he had wandered into the streets, he would have had no idea how to make his way back to his friends at the soup kitchen. He was in bed in a dorm-style room that could house a dozen men. He was clean, shaven, and in a hospital gown. But his wrist was tied with a length of sheet, secured to the side of the bed. They were trying to prevent him from running away. He was distant and mostly unresponsive. I had brought him a small radio as a gift, because I knew he liked to listen to the baseball games. He barely acknowledged it. I was shocked when I saw him. He looked nothing like the smiling, happy man that I had become friends with at the soup kitchen. I left the hospital in tears. And I never saw him again. I know that those who put him there thought they were doing the right thing. He received needed medical care, a warm place to sleep, and regular food. He was safe. But he was also absolutely miserable. They had saved his body, but killed his spirit. I often think of that old man. Good people want so much to help. And yet sometimes helping can be so complicated. What was the right thing to do? In the best of worlds, we would have been able to provide local care for him, and housing in his own neighborhood. And then, it seems, that allowing him to stay outside all day and drink sake with his buddies, even though it was ruining his health, would have been his decision. Those of us with more money get to make choices like that – but too frequently, poor people and mentally ill people are stripped of their right to decide how to live out their lives, in the name of charity. There are no easy answers. But seeing his vacant eyes in that hospital bed, with all of the joy gone – that was no solution. This is the time of year that I miss Japan the most. For three years, I lived in Kyoto and Osaka, studying, teaching, and becoming part of a community. I was lucky to share my life there with several Japanese families, and with the Nakamuras and the Masumotos, among others, I was able to experience the best of all the holidays. New Year’s is the longest celebration of the year. For the last week of December, women are busy preparing food, every imaginable kind of delicacy. They make enough to last through the first three days of January, so that throughout the days off everyone has plenty to eat, but no one has to spend the holiday in the kitchen. For three days, all the businesses close down, from giant corporations and banks, to the mom and pop stores on the way to the train station. Everything closes. And people focus in on family, on neighbors, on community. On New Year’s Eve, at midnight, everyone goes to their neighborhood Shinto shrine. They bring with them the amulets from the past year, wooden and paper placards, animals, arrows with blessings tied to them. At the shrine, each person takes turns approaching the huge bell, and tugging at the thick rope to ring in the new year. Then the old amulets are brought over to the bonfire, and thrown in. Crowds of people stand around and watch the old year burn away. And each person leaves the shrine with new amulets, for the new animal year, starting off fresh. On New Year’s Day, we usually woke up late and moved slowly. Food was available all day; there was no set meal time. People just ate, and drank, and visited. It is the time of year when you pay respect to relatives, local community leaders, bosses and teachers. When I spent one New Year’s with a high school principal, people came to the door for days bringing small gifts of food, bowing to this teacher, asking for his continued favors for themselves and their families. And it is also a time to visit the large temples, to make religious pilgrimages a little further away. First we spent hours preparing, all the women together, with the older women in the family dressing the younger women up in kimonos. I remember one year standing still for nearly two hours while five elderly aunts and grandmothers labored over my holiday outfit, putting on layer after layer of clothing, tugging and tucking and fussing. By the time the obi had been tied, I had been transformed; I felt like a living doll. Then we all took the train together to the temple, walking through the snow in our zoris, carrying our parasols. And then there were the afternoon karaoke parties, with everyone in the group taking their turn at the microphone, while the others cheered them on. I spent hours rehearsing a Japanese pop song so that I would be able to hold my own. Every year, when our New Year’s Eve parties are being planned, I am flooded with memories of Shinto shrines, kimonos, big snowflakes, bonfires, and friendship. And I find myself checking out airfares to Tokyo in the newspaper. Oshogatsu omedetou. Happy New Year. Sometimes cultural misunderstanding can be as simple as a pair of shoes. A while ago, I met two women who had spent a week doing a homestay with a family in Japan the previous year. The women explained to me that during the visit, as they entered the house, or the garden, or the toilet room, there were always slippers placed on the floor. Their hosts instructed them to slip out of one pair and into another as they ventured around the house and yard. The alarming frequency of slipper donning and removal soon had the guests completely bewildered. They were constantly wearing the wrong slippers into the toilet, or forgetting to shed the toilet slippers when back in the house. The hosts were beside themselves, trying to explain in broken English the proper time and place for each kind of footgear. And whenever the guests made an uncorrectable error – that pair of slippers ended up in the trash. My friends laughingly told the story about their complete inability to adopt a custom which, to their Japanese hosts, seemed simple enough for a child. Having lived in Japan for a long enough period of time, I shared the wronged sensibilities of the Japanese hosts. It is a very basic rule. The world outside of the home is dirty. Shoes that you wear on the street should never, never come into the house. That rule is absolute. Not even construction workers or moving crews violate it. When two men moved a piano into my home, they picked up the piano in the street with their shoes on, and, balancing it on their backs with straps, paused in the doorway long enough to remove their shoes before stepping into my foyer. Once the piano was in place, they slipped back into their waiting shoes and were gone. In the house, it was acceptable to wear house slippers. But those were not to be confused with toilet slippers. You had to slip out of the house slippers, put on the cheap plastic slippers meant only for the toilet room, use the facilities, then step out of those slippers and back into the house slippers. And if there was an inner garden…well, there was probably another row of slippers to put on to wear in the yard. When I was first trying to rent an apartment in Kyoto, I had several instances where I was initially told there was a vacancy, and then suddenly informed that the apartment was taken. The rapid change occurred when the landlords discovered that I was an American. Or really, not a Japanese. At first, I took great offense, thinking it was clear and absolute discrimination. But later, after talking to a Japanese friend, I found out the truth: landlords were afraid that a foreigner would ruin the floor in the apartment, since they had no concept of slippers and such. Once I discovered the fear, I was able to alleviate it. I met with the potential landlord, explained (in Japanese) that I understood Japanese customs, and professed complete understanding of the shoe issue. The floor was sacred ground, as far as I was concerned. As if by magic, I found that the previously occupied apartment was now vacant, and I was given a warm welcome, with no further problems. Thinking back on all of this, it makes me wonder how often a simple difference in custom creates seemingly insurmountable barriers between different groups of people. If shoes can lead to housing discrimination, imagine what a difference in religious beliefs might stir up? It has served as a gentle lesson for me. When faced with behavior that I do not understand when traveling or when coming up against other cultures in my own country, I try first to observe instead of passing judgment. Often, sitting quietly and watching, or opening dialogue, has left me with a new understanding of the situation. You could call it the wisdom of slippers. On Sunday, I will go to sangha member Susan Spencer’s house to glaze my jizo. A jizo is a guardian spirit, a little bodhisattva, who protects women, children and travellers. The statues come in various forms and shapes, but all have a beatific smile, a childlike appearance, with great serenity and patience resting on their brows. When I lived in Japan, I saw jizo everywhere. Because they are frequently purchased at temples to honor children lost to miscarriage or abortion, or infant death, the jizo I saw were usually dressed, clad in miniature red knitted bibs, shawls or hats, with toys placed nearby. Women use the figures to grieve, and to wish the lost children (mizuko, or “water children”) safe passage to their next place. I have always wanted to have a jizo of my own, but never made that happen. Then, in the spring, Russian River Zendo created landscaped temple grounds with a gift from a sangha member who had passed away. Ceramicist Susan Spencer suggested that the sangha create jizo in her studio for the grounds. Over the summer, I participated in one of the workshops, making a jizo for the garden. It was a wonderful, frustrating experience in “beginner’s mind.” I had a clear idea of what I wanted my jizo to look like – but I hadn’t worked with clay since fifth grade, and even back then, I was none too skillful at it. That day at Susan’s, nothing seemed to be going as I planned. The head was misshapen, the ears too big, the nose odd looking. I was so annoyed after the first thirty minutes that I almost left and went home. I’ve never been very patient with tasks that I don’t have a natural talent for – I guess that’s the down side of having too many other things come easily for me. But I eventually got over my surliness and just did the best I could, summoning up as much humor as possible. The end result was a figure who looked more like Yoda from Star Wars than a Japanese monk. Sigh. He now stands guard at Russian River Zendo, a tangible testament of my imperfect offering. 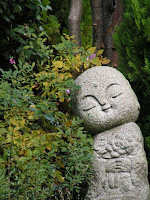 Susan offered to hold another workshop this fall, for those of us who wanted a jizo for our own gardens at home. I decided to try again. I kept it really simple this time, going on the theory that less is more. In particular, smaller ears! I haven’t seen how he survived the firing yet – and this will be my first time to do glazing, as Susan did that for me the last time. I can’t wait to meet up with my little jizo again. I am determined to love him, no matter how he turns out. It’s the heart in the clay that matters, right? Language note: In Japanese, there is no plural form for words. So, when I use Japanese words, like jizo, I don’t add an “s” when there are more than one of them. Whether the subject is singular or plural is indicated by context only. I lived in Japan from 1990 to 1993, in Kyoto and Osaka. I have a master’s degree in Japanese studies from the University of Washington in Seattle, and initially went to Japan on an 18-month Japanese Ministry of Education fellowship to study. I extended that stay for another 18 months, because I fell so completely in love with the country and its culture. The Japanese have a concept called wabi sabi. It refers to beauty that is imperfect, unfinished, and fleeting. Much of what we think of as the Japanese aesthetic (ikebana or flower arranging, the tea ceremony, the Zen sand gardens, the style of some of the most famous temples and shrines) reflect wabi sabi. It is exemplified by everything that is simple, modest, intimate, asymmetrical, and prone to the influences of nature through aging, rusting, disintegrating. There are two other Japanese words that are applicable here: hade and jimi. Hade refers to things which are brilliant and ostentatious, big and bold. Jimi refers to that which is muted, natural, rustic, understated. The Japanese love to give gifts, on almost any occasion; whether they are bringing you an omiyage (souvenir) from a trip they just went on, paying New Year’s respects, or simply sharing a meal with you, they never arrive empty handed. Through this practice of gift giving, my large circle of Japanese friends soon realized that I delighted in the aspects of their country that were jimi – and, to my surprise, they received me with greater intimacy after that, feeling I was accepting of the “original” Japan, with its vast history and ages-old traditions. I was honored that they were willing to teach me, month after month, by introducing me to all that was essentially Japanese, from sumo wrestling to koto playing, from the art of kimono to seasonal rituals at nearby temples and shrines. A perfect example of the contrast between hade and jimi is two famous Zen temples in Kyoto, the Kinkakuji (Golden Pavilion) and the Ginkakuji (Silver Pavilion). The Golden Pavilion is actually covered in gold leaf. It towers three stories tall above a stupendous reflective pond. It takes your breath away with its splendor. The Silver Pavilion is something very different. Although it was originally intended to be covered in silver foil, that never happened. The temple has been allowed to stay the way it was then, five hundred years ago, a modest wooden structure weathered by the rain and the snows, surrounded on one side by a beautiful pond, nested into the trees. It also is the site of the very famous sand garden that has a miniature Mt. Fuji at its center. Ginkakuji is known as one of the premiere examples of the wabi sabi aesthetic. I went to The Golden Pavilion only twice during my stay, once on my own, and once with visiting family. But Ginkakuji, the Silver Pavilion – I went there as often as I could, to walk through the quiet gardens, to touch the weathered wood, to let the beauty sink into my soul. When I am homesick for Japan, this is what I think of: monks raking the sand garden at Ginkakuji, with the rippling reflection of rocks and twisted pines in the background, and the aging temple rising gently above it all.